For the young residents at The Nazareth Centre, it felt like Christmas all over again as 40 baskets arrived just before the Easter holidays. 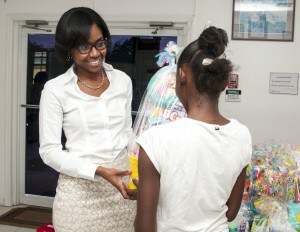 Nassau Airport Development (NAD) managers made the special delivery along with much-needed items for the home. 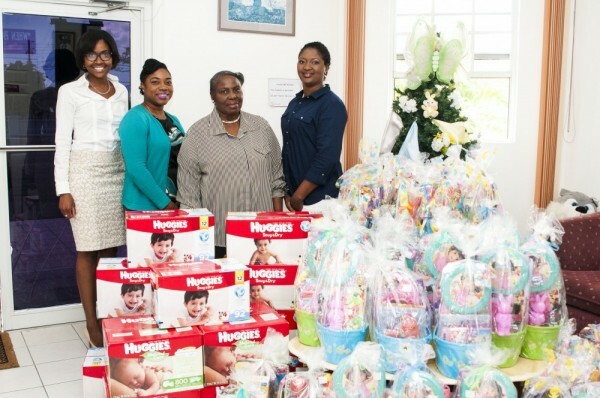 The company made the donation as a part of its Spring giving initiative and to support a cause close to the heart of NAD’s Assistant Controller, Gennyne Hepburn (far left) who is a member of the group Friends of The Nazareth Centre. Home Administrator Fiordelisa Bain (third from left), said the baskets are a welcomed treat for her kids during a time of year when they typically receive less donations. She thanked the airport managers for their gifts. “I wish there was another word for grateful but we truly are grateful for your generosity.” Established in 2001, the Nazareth Centre is a joint partnership between the Government of The Bahamas and the Catholic Archdiocese. It offers a safe home for children from infants to pre-teens. In addition to government subsidies, the Centre relies heavily on the support of individuals and corporate citizens like NAD. Pictures l to r: Gennyne Hepburn, Assistant Controller at NAD and a member of Friends of The Nazareth Centre, Shonalee Johnson, Manager of Communications, NAD, Fiordelisa Bain, Administrator of The Nazareth Centre and Sian Bevans, Director of Human Resources, NAD. Gennyne Hepburn, NAD’s Assistant Controller and member of Friends of The Nazareth Centre, distributes baskets to children from the home. Sian Bevans, NAD’s Director of Human Resources, distributes baskets to children from The Nazareth Centre.